The band program depends on many funding sources made possible by the careful planning and hard work of the band directors, students, and the many band boosters. The band directors strive to keep band program costs low compared to similar county programs. There are two basic types of fundraising, general and student account. General fundraisers directly support all activities of the band. Six basic types of general fund raising activities occur each year. TAG DAY – (Fundraiser Organizer: Jon Anderson & Erica Hosken ) Tag Day is the major fund-raising event for the band. All students are required to participate. Tag Day is held the first Saturday after the start of school, with the following Saturday as a rain date. Students wear their band uniforms. Many parent volunteers are needed prior to and on Tag Day to help with this event — Volunteer Form. The workday ends with a fun pizza party at the school. Post Tag Day: For those of you who missed our energetic students walking through your neighborhood on Tag Day, it’s not too late to contribute! 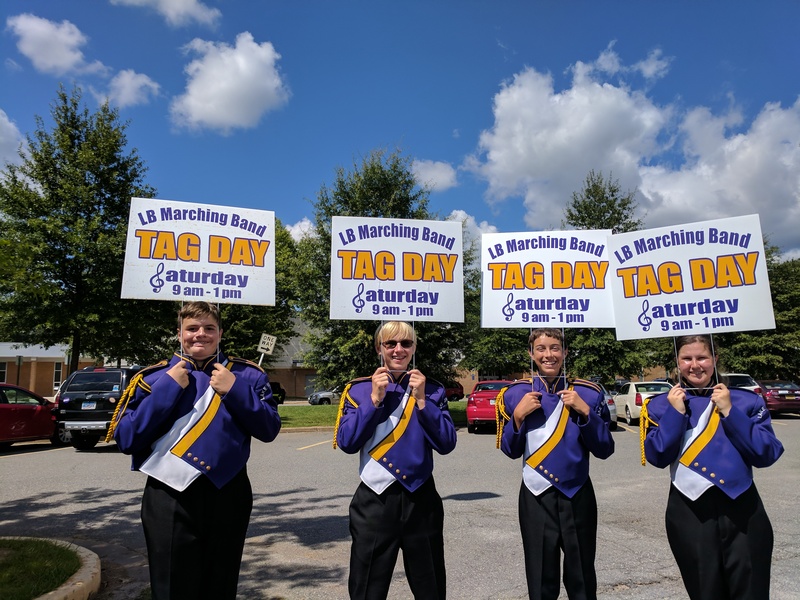 Send your contributions by check, made out to LBBB, to Lake Braddock Secondary School, Attn: Music Dept, 9200 Burke Lake Road, Burke, VA 22015, with ‘Tag Day’ on the memo line. WHITE HOUSE ORNAMENTS (WHO) – (Fundraiser Organizer: Jennifer Morris) The LBSS Band raises funds through the sale of eye-catching White House ornaments. Many families and collectors prize the new ornament issued each year by the White House Historical Association. Current and previous years’ ornaments are available. Students can earn letter points by taking part in this fundraiser. Band families are encouraged to purchase these dazzling collectors’ items as gifts for relatives and friends. 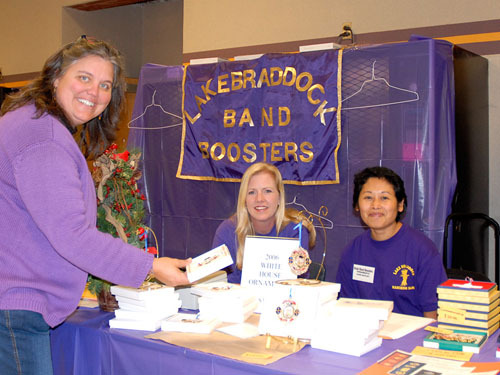 In addition, band families can sell ornaments to coworkers, friends and relatives, with all funds raised supporting the band. CAR WASHES – The Student Band officers sponsor and arrange car washes that occur at the start of marching band season. All band and guard members are encouraged to participate. Funds raised are earmarked for the Student officer gift to the band at the end of the year. Any extra funds also help defray the costs associated with producing the slide shows presented at the Progressive Dinner and Spring Banquet, senior flowers at certain events, and the creation of the annual band photo collage. Students can earn a letter point if they attend all car washes. BRUIN SPIRIT WEAR – Spirit Wear will be available to order online through Burke Sporting Goods from August to September. The following fundraiser is open to all Band and Color Guard members and makes it possible for students to earn money to offset some or all of their personal band expenses during the year. The rebate received is allocated to individual student accounts as earned by that student. How often have you been caught without cash but didn’t want to use a credit card? SCRIP can be used in place of cash, checks, and credit cards for everyday expenses like groceries, gasoline, clothing, and other essentials, as well as for entertainment expenses like movies, restaurants, and even vacations. Nearly 700 vendors are available nationwide! You can also give them as gifts or e-gifts. For every dollar of SCRIP you purchase your student earns 2-18% (or more) towards the spring trip and band funding without you spending an additional penny! Scrip is the only individual fundraiser currently available. Pull out a SCRIP card to pay for your purchases at hundreds of national and local retailers where you already shop. In many cases, you can print “ScripNow” at home or reload a plastic card already in your wallet before walking out the door. And with www.myscripwallet.com, a mobile scrip website, you’ll be able to easily order ScripNow® eCards, reload existing plastic cards, pay for these products using your PrestoPayT account, and redeem them directly from your smart phone (iPhones and Android devices). It uses your existing ShopWithScrip® and PrestoPay account, so you have access to more than 300 of your favorite brands available in ScripNow eCards, and over 100 brands that can be reloaded. You can now order SCRIP online, instead of using paper order forms. This gives you more vendors to choose from and saves time and paper all around.
. Go to www.shopwithscrip.com and register by entering your e-mail address, creating a password, and filling out the required information, including your student’s name.
. Accept the “terms and conditions” and enter the LBB Enrollment Code 2FL5B2L1117L4. Activate the “Presto Pay” tool and conveniently pay online at the time you place your order. Your payment will be electronically deducted from your checking account. There’s only a small fee of 15 cents per order-less than the cost of a postage stamp or the gas used to drop off a check at school! Easy on the coordinator and treasurer, too! MEMORIAL FUND – As many of you know, the band and the boosters lost a dear friend and supporter a few years ago. Sharron Ries, wife of Vincent and mother of Drew, a senior trombone player, died after a valiant battle with cancer. Sharron and her family have been long-time supporters of the band and Sharron served in many positions over many years. We would like to honor Sharron’s contribution to the band and boosters with a memorial fund. Mr. Luley and Vincent are giving thought how best to use the memorial fund to honor Sharron’s service. If you would like to contribute to the memorial fund, please send a check, payable to Lake Braddock Bruin Band Boosters, c/o Lake Braddock Secondary School, 9200 Burke Lake Road, Burke VA 22015. In addition, you can send donations in with your student to be placed in the purple box in the main band room or you can hand deliver donations to Julie Moore at any band function. Please write “Sharron Ries Memorial” on the memo line of the check and on the envelope if hand delivered.